'Inni', a live album/DVD, recently spouted from the Sigur Ros archives but it is the recent activity of their frontman, Jonsi which is piquing my interest at the moment. Unsurprisingly so, considering we made his debut album, 'Go', the FG Album Of The Year for 2010. Hear 'Gathering Stories' from his soundtrack to Cameron Crowe's latest feature film, 'We Bought A Zoo' below. Co-written by the director himself, no less. Jonsi has some recent form in terms of soundtrack contribution, as he donated a new track to last year's wonderful animated feature 'How To Train Your Dragon'. Sigur Ros, with their vast array of magical songs, have unsurprisingly featured in many films. Perhaps most prominently in Cameron Crowe's English language remake of 'Vanilla Sky'. So this collaborative return is most welcome. 'We Bought A Zoo' (trailer below) stars Matt Damon and Scarlett Johansson and is an adaptation of Benjamin Mee's memoir, which discussed how he and his family moved to and restored a dilapidated zoo in the English countryside. The Hollywood version moves the "action" to rural America. Obviously. And somewhat disappointingly. NPR has a fantastic/brief explanation from Mr Crowe about how Jonsi's previous musical exploits were a great inspiration for everyone involved on the film and how a more tangible collaboration developed. It's a pity that, 'Gathering Stories' and 'AEvin Endar' are the only fully formed new tracks to appear on the soundtrack. But any new Jonsi material is a blessing, and the song is typically heavenly offering. Listen below. 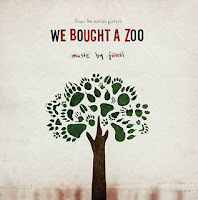 The soundtrack to 'We Bought A Zoo' is available on December 13th, while the film hits UK and US cinemas just before Christmas.